Simplify your picture taking and improve your pictures! Photography is a bit like losing weight. You seem to progress just so far, and can't seem to progress any further. Many photographers approach this by purchasing new equipment. This is often the worst way to approach this. New equipment means a new learning curve. A new learning curve means you're not going to improve. Newer and higher-end cameras just make photography more difficult until you've mastered the basics. Wouldn't it be nice if there was a way to SIMPLIFY taking pictures? With less to think about, you could take better pictures. Well, this eTip is about one thing that will both simplify picture taking and significantly improve your images. When you shoot JPEGs, the camera creates a RAW file first, which usually isn't saved. This RAW file is just as the name implies: RAW. The color, contrast saturation, hue, sharpness - just about everything about this file, is wrong. But, it contains a LOT of data - enough to create a beautiful image. When you choose to save the RAW image, instead of the JPEG (you can actually save BOTH - more below), you get to choose what your image looks like, because you get to do the middle step above. Computer software makes this VERY easy, but it does require you to post-process your images on a computer - but, the difference can be startling! 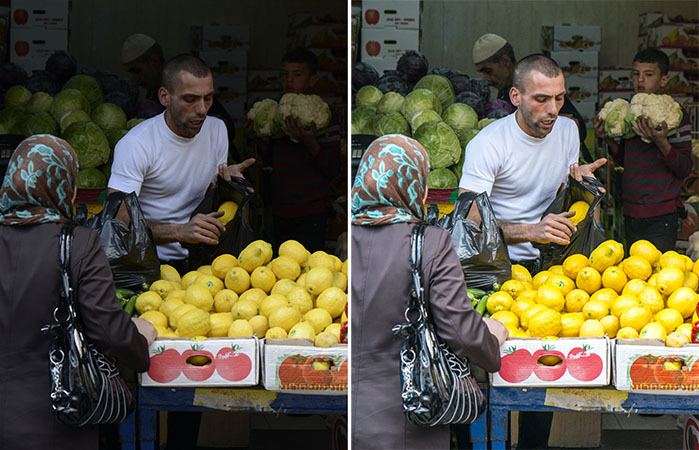 The image on the left is a JPEG right out of the camera and the image on the right is a RAW file that was post-processed with just a few mouse clicks (in Photoshop). An easy way to do this is to tell your camera to save BOTH RAW and JPEG images. That way, you can use the JPEGs that look OK, and post-process the RAW files for the images you really like. As a reminder, you can post-process your JPEG files, but, remember, the camera destroys about 90% of the data in the RAW file when it creates the JPEG. Post-processing software can't do much to improve an image once it's become a JPEG. If you're Shooting JPEG, you're probably doing it WRONG! 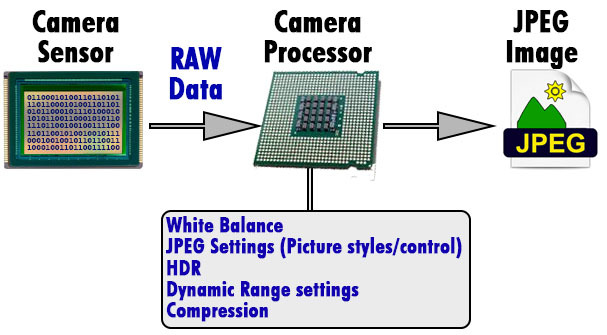 Shooting JPEG images (as opposed to RAW) requires that you constantly change your camera settings. And if you're not constantly changing your settings, you're shooting JPEG WRONG! To take JPEG pictures properly, you should be setting and re-setting a bunch of settings on your camera each time you shoot, otherwise color, sharpness, contrast and other image attributes will be wrong. You have to re-set these settings for each type of environment you shoot: daylight, indoors, etc., and for each type of subject people, landscapes, etc. The way your camera defaults, is not best for ALL pictures - people may come out with too much contrast and color (think "splotchy" faces), and landscapes may come out with a lack of contrast and color. Colors also come out wrong with the default settings, since the White Balance needs to be changed for each type of lighting - cloudy day, indoors, shade, fluorescent light, etc. 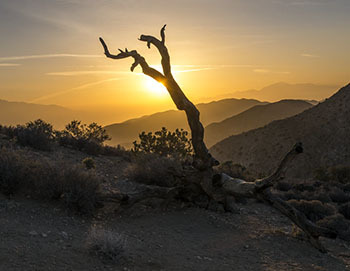 Shooting RAW actually makes taking the picture easier – you don’t have to worry about White Balance, Picture Styles (Canon)/Picture Control (Nikon) and multiple camera tone settings. These are critical features your camera has for shooting JPEG images, and it can complicate your life immensely. If you aren’t changing these settings for each lighting and subject change, then your JPEG images are guaranteed to disappoint. Shooting RAW is SO much easier, because you don’t have to worry about these things. But, you do have to post-process your RAW images. If you don’t shoot RAW, I’m going to guess that you think it’s difficult to post-process RAW images. It isn’t. I have taught many people to process their RAW images in Photoshop, and they almost always have the same look of disbelief at how easy it is. A free CheatSheet to get you going! My goal is to help you take better pictures thru my experience. If you’ve read this far, here’s a free gift - a document I created to help you edit your RAW images in Photoshop in 10 easy steps or less: http://www.PhotoCheatSheets.com/PhotoBert-PhotoshopInstructions.pdf. Once you get the hang of it, and it becomes "automatic" very quickly, it shouldn’t take you more than 1 minute to edit most images, and I guarantee you that the results will most often be significantly better than your camera-processed JPEG images. The instant gratification of photography is wonderful - we get a great sense of accomplishment. But, to really fulfill the accomplishment, you really need to shoot RAW images and post-process them. It may "sound" difficult, but it really isn't, and the gratification you receive, although not instant, will be far greater!